While we already know most of the details around the Galaxy Note 9, including a pricing leak, the release date has been a subject of guesstimates and speculation. No more, though, as a leaked pre-launch poster in a Korean carrier store clearly depicts August 24th, just as the rumors had it. Samsung will apparently start the preorders as soon as August 10th, a day after the unveiling, and those who preordered will have the chance to get their puppy earlier than the rest and will receive a bunch of gifts to go along with it. 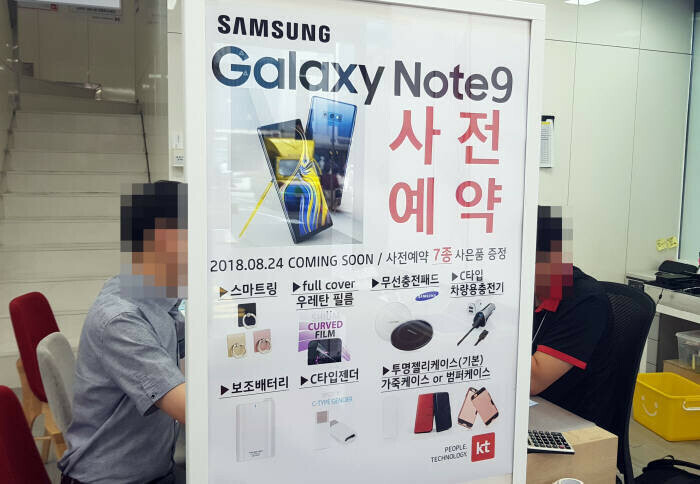 In Korea, the Note 9 preorders will come with no less than seven gifts directly from Samsung - cases, car chargers, "smart" grip rings, power banks, wireless pads, the works. That's in addition to whatever promos carriers decide to throw the phone's way, too. While Samsung might not throw these same gifts for the US crowd - who uses grip rings anyway - there will be a gift basket with the phone nonetheless, it seems. The big selling points outlined for carrier reps are the large memory amounts - 6GB/128Gb and 8GB/512GB (for the domestic market only, bummer) - but also the long battery life and the Bluetooth S Pen that will let you control games, music, the camera and so on. We'd add to that list the Note 9's expected gaming prowess, as it's purportedly full of heat piping to take care of the GPU speed boosts and will eventually be the first Android phone you can play Fortnite on. We'll see how the handset fares in the market, but for now you have about three weeks to save before the Note 9 hits the tape. US may get the icon X's bundled with the phone. Hello, I'm Korean and this is not Samsung's official gift. This photo was taken from thirdparty phone reseller. Which you can clearly see in the picture, the 3rd parties icon. In the US, Samsung typically offers a choice of the bundle option. A price consideration (50% off of the watch) for an LTE-enabled Galaxy Watch bundled with the Note9 would do it for me. Absent that, an LTE-enabled Gear S3, either one, would be a nice inducement to pre-order. I received the very nice Gear 360 Camera last year as a gift for pre-ordering the Galaxy Note8. I had the 360 Camera in-hand on September 13th, 2017 which was two days before the Note8 went into wide-release. Verizon shipped pre-orders early, over the Labor Day weekend last year, and most pre-orders were received last September 5th and 6th. I'd hope to see Verizon ship the pre-orders early this year too. '... and the Bluetooth S Pen that will let you control games, music, the camera ' Those features can not justify the impractical, heavy battery inside the S Pen. Hope Samsung has better reason to make S Pen with BT. How much does that spen weigh now? Would like your full review today seeing as you are knowledgeable on the subject. It's really light, it feels like oversized toothpick. Will be nice if they add some extra weight on it. Yes, a little heft wouldn't hurt. I think of the stylus on my Palm Treo 650 from 2004. While that stylus is much more slender than the S-Pen the Treo's stylus has a nice heft to it; I just happened to be looking at my old smartphone a couple of days ago. How do you know the S-Pen will have a battery? If it does, what indication do you have of its weight? Because photos of the new S-Pen on PA, show it to be identical to the one in the Note 8. I've use solid sized pens like the one that comes with the Surface Pro, and as big as they are, they are not heavy. So how heavy is a 3.5" pen gonna be? How do you know the feature isn't still gonna be powered by the WACOM digitizer housed under the display? That's right, you don't. Why not wait and stop spreading false information which you have zero confirmation of to begin with. I have a Note 8 with over 240 apps installed and nearly 3GB of my RAM is available to me. So if you need more ram, you must be installing junk from unknown sources. And if so, more RAM isn't gonna solve your problem. You don't understand. When I open 4 tabs on Chrome and browse and return back to 3rd tab the whole page restarts. There are times when Ram isn't available so the app restart due to insufficient Ram. those gifts are from KT telecom...not from samsung official..